Port Vila, Vanuatu - It’s all hands on deck as 15 warehouse workers heave, push, lift and carry boxes of emergency supplies that have just arrived in a 40-foot container at the UNICEF ware-house in Port Vila, Vanuatu. UNICEF’s emergency responses in support of affected children always include a strong supply component and the response to Cyclone Pam, a Category 5 cyclone that devastated the Pacific Island nation of Vanuatu a month ago, is no exception. Today, 100 metric tonnes of essential emergency supplies have arrived all the way from Copenhagen. 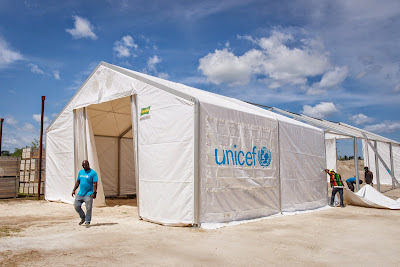 The supplies, in 10 x 40 foot containers, include pre-packed education, water and sanitation (WASH), recreation and emergency health kits that are ideal for emergency situations. Each kit contains a complete set of supplies and instructions for use, so that they can be distributed to out-lying schools, health posts and communities and be ready for immediate use. 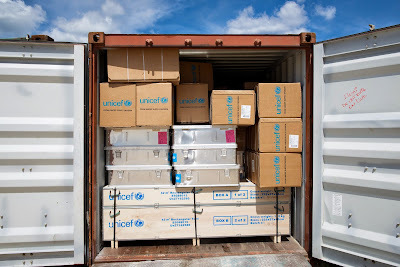 UNICEF emergency supplies in a 40 foot container that just got delivered to the UNICEF ware house in Port Vila, Vanuatu. This is part of a 100 metric tonne shipment that arrived from Copenhagen in 10 x 40 foot containers. The logistics of organising a shipment as large as this are complex, starting as soon as UNICEF’s Supply Division in Copenhagen receives a request from the UNICEF office in Vanuatu. As many as 30 additional staff in Copenhagen helped to pack 100 tonnes of supplies in just two days. These were then airlifted on March 30 in a B777 cargo freighter to Noumea, New Caledonia with several stops along the way in Dubai, United Arab Emirates, Manila in the Philippines and Brisbane in Australia to pick up additional supplies all destined for Vanuatu. In Noumea, it took three hours to offload the cargo and twice as much time to repack themin 10 x 40 foot containers. The containers were then delivered to shipping vessel, Capitaine Tasman at Port de Noumea to make the one-day sea journey to Vanuatu. After a process spanning nine days and some 20,000 kilometres across six countries, essential items needed for children’s survival and recovery from the traumatic experiences of Cyclone Pam are ready to be distributed to those who need it most. And 15 young men, whose lives and families have also been affected by Cyclone Pam, are working long hours to ensure these items are distributed as quickly as possible. “It is great working here. Some of our workers here have been badly hit by the cyclone, they don’t have any roof over their heads but they still smile and they still come to work every day. That’s amazing, it touches you down here, right in the heart,” adds Karsten.